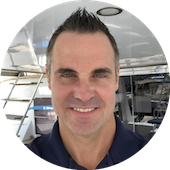 “If you are looking for trusted and knowledgeable support when purchasing a catamaran, seek out Jim Ross of Just Catamarans as your broker. From our first contact with Jim, he set us at ease, always had time for us, provided straightforward advice, communicated constantly, and went way beyond anything we expected. Jim was always well prepared and anticipated our needs throughout the entire process. Jim Ross is a key reason for Just Catamarans well earned reputation for superior sales and service. We always felt that Jim was looking out for our best interests, and he has continued his excellent support and guidance even after the purchase. Besides being everything we needed of a broker during our catamaran purchase, what we really think you should know is that Jim is a genuinely nice, authentic guy that turns what could easily be a somewhat scary, anxiety-filled process into a relaxing and fun adventure.